I have a fork of a small open sourced library that I'm working on on github. I'd like to make it available to other developers via maven, but I don't want to run my own Nexus server, and because it's a fork I can't easily deploy it to oss.sonatype.org. What I'd like to do is to deploy it to github so that others can access it using maven. What's the best way to do this? Unlike some other proposed solutions, it doesn't conflict with your gh-pages if you're using them. The typical way you deploy artifacts to a remote maven repo is to use mvn deploy, so let's patch into that mechanism for this solution. Now try running mvn clean deploy. You'll see that it deployed your maven repository to target/mvn-repo. The next step is to get it to upload that directory to GitHub. The mvn-repo branch does not need to exist, it will be created for you. Now run mvn clean deploy again. You should see maven-deploy-plugin "upload" the files to your local staging repository in the target directory, then site-maven-plugin committing those files and pushing them to the server. 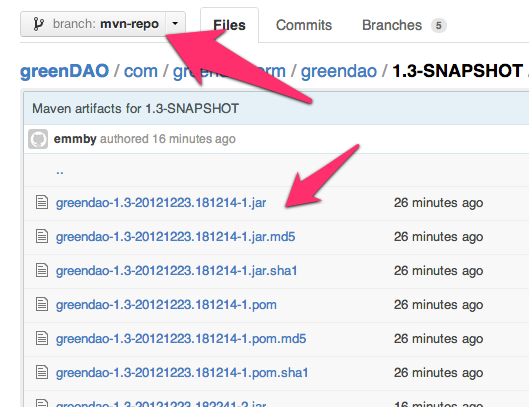 Visit github.com in your browser, select the mvn-repo branch, and verify that all your binaries are now there. You can now deploy your maven artifacts to a poor man's public repo simply by running mvn clean deploy. Now any project that requires your jar files will automatically download them from your github maven repository. Edit: to avoid the problem mentioned in the comments ('Error creating commit: Invalid request. For 'properties/name', nil is not a string. '), make sure you state a name in your profile on github. Don't use GitHub as a Maven Repository. Edit: This option gets a lot of down votes, but no comments as to why. This is the correct option regardless of the technical capabilities to actually host on GitHub. Hosting on GitHub is wrong for all the reasons outlined below and without comments I can't improve the answer to clarify your issues. The best option is to convince the original project to include your changes and stick with the original. Since you have forked an open source library, and your fork is also open source, you can upload your fork to Maven Central (read Guide to uploading artifacts to the Central Repository) by giving it a new groupId and maybe a new artifactId. Only consider this option if you are willing to maintain this fork until the changes are incorporated into the original project and then you should abandon this one. A jar is an output of your project, it can be regenerated at any time from its inputs, and your GitHub repo should contain only inputs. Don't believe me? Then check Google results for 'dont store binaries in git'. GitHub's help Working with large files will tell you the same thing. Admittedly jar's aren't large but they are larger than the source code and once a jar has been created by a release they have no reason to be versioned - that is what a new release is for. If anyone adds your repo they impact their build performance as they now have another repo to check artifacts against... It's not a big problem if you only have to add one repo... But the problem grows and the next thing you know your maven build is checking 50 repos for every artifact and build time is a dog. That's right! Maven needs to check every artifact (and its dependencies) defined in your pom.xml against every Repository you have defined, as a newer version might be available in any of those repositories. Try it out for yourself and you will feel the pain of a slow build. The best place for artifacts is in Maven Central, as its the central place for jars, and this means your build will only ever check one place. As answered elsewhere the idea is that JitPack will build your GitHub repo and will serve the jars. The requirement is that you have a build file and a GitHub release. The nice thing is that you don't have to handle deployment and uploads. Since you didn't want to maintain your own artifact repository its a good match for your needs. Another alternative is to use any web hosting with webdav support. You will need some space for this somewhere of course but it is straightforward to set up and a good alternative to running a full blown nexus server. Finally, if you have any standard php hosting, you can use something like sabredav to add webdav capabilities. As an alternative, Bintray provides free hosting of maven repositories. That's probably a good alternative to Sonatype OSS and Maven Central if you absolutely don't want to rename the groupId. But please, at least make an effort to get your changes integrated upstream or rename and publish to Central. It makes it much easier for others to use your fork. If you have only aar or jar file itself, or just don't want to use plugins - I've created a simple shell script. You can achieve the same with it - publishing your artifacts to Github and use it as public Maven repo. Not the answer you're looking for? Browse other questions tagged maven github github-pages mvn-repo or ask your own question. How to publish artifacts in Travis CI? Can I use a GitHub project directly in Maven? Is there any free online maven repository? What's the fastest way to get a private Maven Repository up and running?